A gigantic navel—or rather, an image of one—hovers before us. Or maybe it’s an orifice. Or a hole in the heavens. 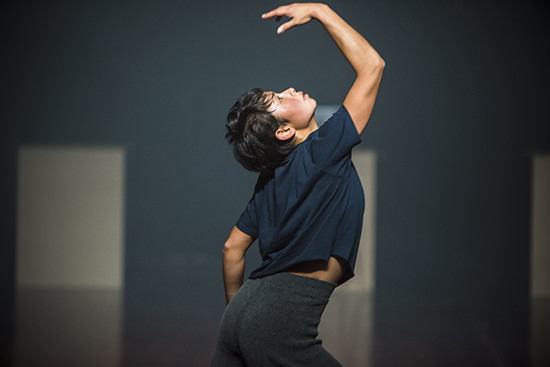 In her program notes, choreographer Lilian Steiner promises “a performance unlike anything we’ve experienced before.” I have to agree: I can’t reconcile what I’m seeing. The moment falls near the end of the work. The journey here has been by turns tedious and exquisite, filled significantly by two men with small rocks in their hands turning slowly for a long time. Admission Into The Everyday Sublime is apparently rooted in the belief that holistic practices, alternative therapies and somatic dance can themselves lead to transcendent experience. It also offers a reflection of the first world obsession with those practices and their commodification. Steiner re-assembles the creative team from her acclaimed project Noise Quartet Meditation (2014). While the team has synergy, the work takes time to find its own. We enter a hall filled with smoke. Four performers—two men, two women—wear matching jersey uniforms. They could be day spa employees. They could be New Age devotees. In pairs, the performers wrestle each other to the ground. Their quick contact improv tackles release into erect poses. Each couple reaches a desperate stillness with one partner offering reiki-like healing gestures to the other. The performers separate and run until a new collision forms. The sequence repeats until the audience settles. The performance simplifies; the pace declines. A bell sounds. The hall could be a temple. The temple darkens. The men are dragged slowly across the floor on lengths of fabric. The women quietly wrap the male performers with the fabrics, then unwrap them. From my viewpoint, the men seem to be asleep. The man seated next to me is asleep. Now upright, each man holds a small rock in one hand and they turn in unison. Slowly. For what seems like a long time. Repetition and extended duration are hallmarks in the work. Are they intended to break down our resistance? I resist. What am I resisting? Investing in the premise? I shift uneasily in my seat. Three women opposite me hold heads in hands. The men keep turning. Exasperated, I shift my attention to the lighting grid. The light state changes to red and I start to appreciate Matthew Adey’s lighting design. Helped by the ever-present haze, the lighting feels concrete. Adey matches the work’s cosmic allusions by confidently pushing our perception of the venue’s volume. His investment reminds me that nothing here is incidental. I’m newly curious about the work’s potential outcome. The energy in the room increases as Steiner and Longville prance pony-like around the floor’s perimeter. The dance erupts into release-technique torso twists and body sequencing. The dancers share a powerful drive as their low leaps surge through space. Both women have remarkable focus in their body placement, projecting gravity beyond poise. Their fingers and toes reach and curve the air. The sequence unravels from tight unison into urgent improvisation, but the attention to detail remains. By now, the male performers have retired to sit guru-like atop plinths at one end of the room. Bastow and Nokes’ soundscape samples and augments the performers’ own guttural moans, developing them into deeply resonant throbs or animalistic growls. Their dance over, Steiner and Longville join their counterparts. Seated slightly above our eyeline, there’s something mildly condescending in their distance from us. Steiner’s work is titled Admission, rather than Invitation, Into The Everyday Sublime. For me, there is a disconnect between the experience of being directly involved in these practices and watching others involved in the moment. Participating in durational scores where one experiences the body changing, releasing its resistance before arriving at a new state of sensation, is different from watching them. For the observer, these may elicit a powerful, even physical empathy. Or it may not. The final moments form an experience that certainly feels transcendent. After the tedium and frenzy of movement, an apparition provides catharsis. On the wall opposite the performers, an immense canvas emerges from darkness as the soundscape intensifies. Its form, representation and meaning are ambiguous. From where I sit, I cannot even determine how it exists. Is it a projection, and if so, where is its source? What initially looks like a crater changes colour and texture as the lighting shifts. My perception of it vacillates. It could be skin, or a static storm. Or a hole piercing the sky, forming an oculus to another sky beyond. I never fully define what I see, but I’ve definitely arrived at a state of wonder: wonder about that second sky. After the performance, several people touch the canvas: a painting by Ash Keating. I talk to a few of them. Understanding its physicality doesn’t explain our experience. Our impressions differ, but we’re all still transfixed.